Toronto – March 12, 2019 – March 14 is National Potato Chip Day, a time when Canadians across the country celebrate the country’s Number 1 snack food. Saskatoon, Sask. – March 11, 2019 – Labour activists, community allies, and family members came out in large numbers on March 8 to show solidarity with striking UFCW Local 1400 members at Saskatoon Co-op. Toronto – March 9, 2019 – Activists from UFCW Canada’s National Office and UFCW Local 1006A recently attended a special event with Tarana Burke, founder of the #MeToo movement, at Ryerson University ahead of this year’s International Women’s Day. 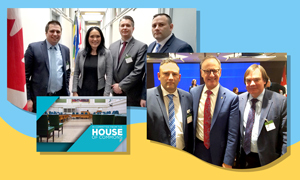 Ottawa – March 8, 2019 – UFCW Canada recently traveled to Parliament Hill to present at a Standing Committee on Citizenship and Immigration hearing on ways to improve Canada’s immigration system and strengthen the rights and working conditions of migrant workers.